Unless women are exceptional in a masculine milieu – that is, throughout recorded history – their lives remain at best a shadow of humanity’s story. In Victorian times, industrialisation had really gendered social organisation, limiting competition for its riches or just for economic survival to men and working class women whose labour was necessary to keep the factories belching out products and pollution. Women of the propertied classes were quarantined to the private, domestic world that left little trace other than through official record keeping and personal communication. So the subheading in the 7 October 1897 edition of the Dundee Evening Telegraph, alerting readers to the distribution of wealth to local women, implies such a thing was remarkable enough to be the headline. 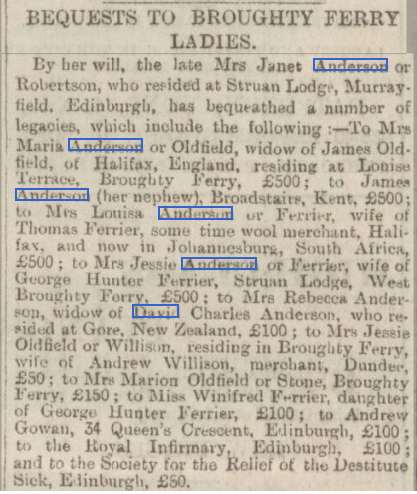 Bequests to Broughty Ferry ladies recorded the distribution of legacies from the estate of Mrs Janet Anderson or Robertson to Mrs Maria Anderson or Oldfield, Mrs Louisa Anderson or Ferrier (sic), Mrs Jessie Anderson or Ferrier, Mrs Rebecca Anderson, Mrs Jessie Oldfield or Willison, Mrs Marion Oldfield or Stone and to Miss Winifred Ferrier. Other legatees were James Anderson, Andrew Gowan, and two Edinburgh charities. Janet (1804-1897) was the widow of Edinburgh baker, James Robertson. Providing their daily bread to Edinburgh’s residents may have been how James and Janet made their dough (sorry), sufficient for her to live a life of independence after his death and to be disbursed after hers. But Janet was also the daughter of James Anderson (1777-1827) and Janet Lownie (b. 1781). James had become a man of economic substance during his career as a wright and house builder in Dundee. On his death, Janet received a small legacy then her part of the remaining disposable estate when her mother died. An indication of the size of James’ estate is that his widow lived independently on an annuity of £70 plus expenses at a time when the average annual wage was around £11 and the elderly poor were allocated £4-6 for the year. The bequests make curious reading. Janet was a mature woman, approaching 40 years old, when she and James married in 1840. 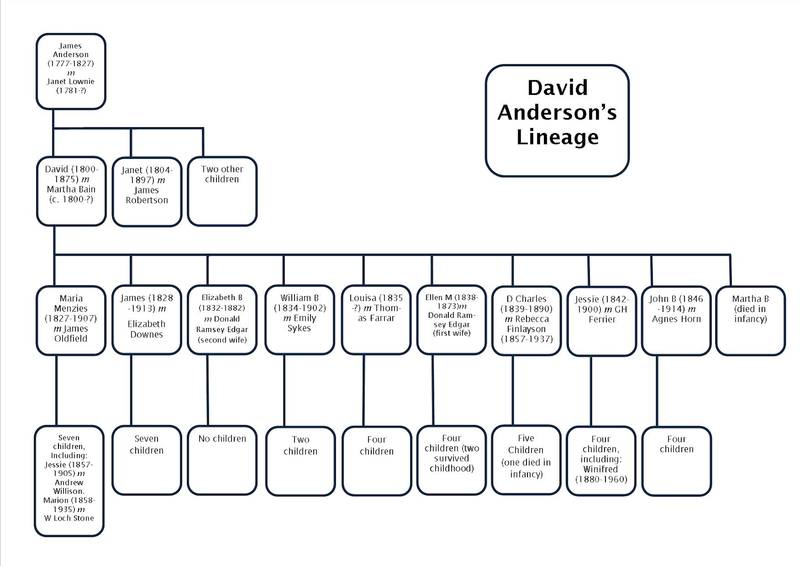 It may have been her age that meant there were no children of the marriage to inherit her estate because most of the beneficiaries named in her will were the descendents of her brother, Dundee banker David Anderson (1800-1875), and his wife, Martha Bain (b. ca 1800). However, the benevolence did not extend to all of their children and grandchildren. David and Martha had six daughters and four sons. Of the six daughters, three had died before their aunt. At the time of Janet’s death, Maria Oldfield (1827-1907), Louisa Farrar (not Ferrier)(b. 1835), and Jessie Ferrier (1842-1900) were still living. Of the four brothers, three were living but only one, James (1828-1913), was a legatee. David and Martha had also been blessed with 36 grandchildren, 31 of whom were alive in 1897, but only three of whom were remembered in her will by Janet. These were Maria’s daughters, Jessie Willison (1857-1905) and Marion Stone (1858-1935), and Jessie’s daughter, Winifred Ferrier (1880-1960). To further pique the reader’s interest, Janet was not equally generous to her great-nieces although the size of their bequests may have been a simple weighting of their expectations and possible future need as indicated by their marital status and likely share of parental estates. But need was not necessarily a factor. Of the beneficiaries, only Rebecca (1857-1937) is known to have been struggling. Her husband, Charles Anderson (1839-1890), had drowned leaving her with four young sons to raise on her own. 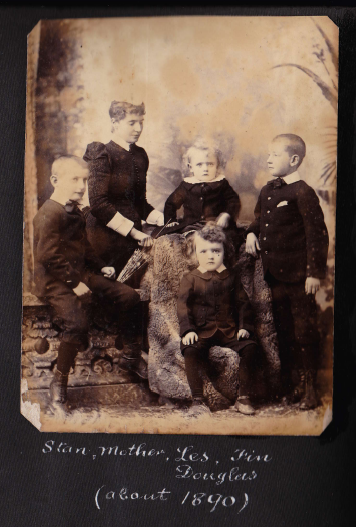 Rebecca Anderson with sons Stan, Les, Fin and Douglas (the author’s grandfather) after their father, Charles’, death. While the boys all eventually lived successful professional lives, these were achieved by their own efforts. Money was very tight during their childhoods with at least one of them unable to go to high school, despite being a high academic achiever, because of the prohibitive cost. Louisa had married Thomas Farrar, a Halifax wool stapler. The 1881 census records that all the young family was living at home, with live-in domestic help, and that Thomas employed seven people in his business. In 1891, only Thomas, Louisa and their eldest daughter were living together. No employees were mentioned and two teenaged daughters were living with an aunt who ran a boarding house in Islington, London. Sometime between the 1891 census and the 1897 Dundee Evening Telegraph report, Louisa, aged around 60, left Britain for reasons yet to be discovered. It may be that times had become tough, so encouraging a move to the colonies where prospects looked brighter or it may have been that the daughters, one of whom was an invalid, were unwilling or unable to leave England. Yet, in the nineteenth century, economic opportunity rather than deprivation could drive emigration. Certainly, within a decade, at least two of Louisa’s nephews, and possibly a niece, were also in South Africa. This suggests their aunt’s family was doing well enough in its new country to attract the interest of the next generation in sharing the prosperity. Halifax was home, too, for Maria after her marriage in 1856 to wool merchant and land proprietor James Oldfield. Their family expanded every 18 months or so until James’ death in 1871. 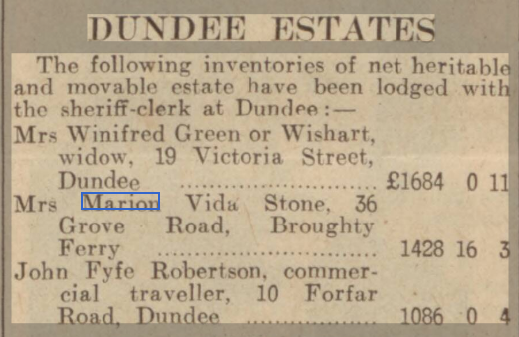 Interestingly, most of Maria’s siblings had also decamped from Dundee to Halifax in the mid 1800s but, excepting Louisa, had all gradually either moved away or died before she returned to Dundee in the 1880s. In 1891, Maria was a woman of independent means living with her daughter, Marion Stone, and two granddaughters in the parish of St Andrew. Marion had been widowed in 1890 after only four years’ marriage. She remained a widow, a lady of independent means, for the rest of her life. Marion Stone’s lifetime as a widow. At the time of the bequest, Jessie was married to textile merchant, GH Ferrier, who traded in Dundee’s famed jute and linen industry and whose eventual estate reflected his success. The couple were parents to three sons and a daughter, Winifred. At least one son, Charles, was living in Dundee in 1897 and assumed control of the family business when his father died in 1900. Winifred herself migrated to the US in 1910 and was a career nurse, never marrying, until her death in 1960. The final Broughty Ferry Lady in Janet’s will was Maria’s firstborn, Jessie Willison. Breaking the pattern of marrying into the textile industry, Jessie wed Andrew Willison, an oil merchant, insurance broker and commission agent. 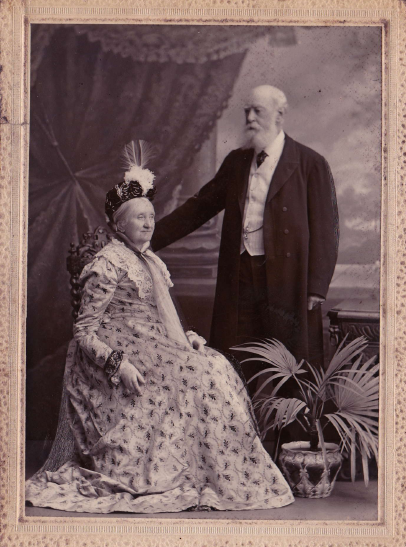 They married in York in 1875 but were living in Dundee from at least 1881, in the same district of St Andrew that Maria moved to when she returned to Scotland. Jessie and Andrew had seven children, several of whom migrated to the US in the early twentieth century. An obvious explanation for Janet’s selectivity is proximity. Three of David and Martha’s sons – William (1934-1900), Charles and John (1846-1914) – had emigrated to New Zealand in the mid to late 1870s. Many of the grandchildren had also distributed themselves around the colonies and the United States of America. This might be thought sufficient explanation for their exclusion, their having to be in the UK to qualify. Yet Louisa was in Johannesburg, according to the report, and Rebecca, whom Janet may never have met, was in Gore, at the bottom of New Zealand’s South Island. Another explanation for Janet’s bequests may have been the perceived worthiness of the recipients. For example, the only nephew remembered, James, had an exemplary, if peripatetic, life in England as a tea merchant after rising through the banking ranks in Dundee early in his career. James Anderson and his wife Elizabeth around the turn of the century. That his son’s vocation was in the Episcopalian church, which seems to have been the Andersons’ religious denomination, would not have hurt. James’ brothers, on the other hand, had a somewhat chequered history. Both William and Charles had started out as bank clerks in Dundee before veering into the wool industry in Halifax, trading under the name Anderson Brothers. In 1869, they were bankrupt and their partnership dissolved although they regrouped because they were winning prizes for the quality of their fleeces at the Halifax Agricultural Show in 1871. At the time of his father’s death, Charles seems to have been back in the world of finance but he was again bankrupt in 1878. Not only that, but the Yorkshire Post and Leeds Intelligence reported he had not turned up to a creditors meeting “having absconded and left the country”. There is no evidence of John having such difficulties. However, the inventory in his father’s will lists among the assets a £296 debt owed by John to his father, which may or may not have been repaid. Although William and John thrived in New Zealand, Janet may well have thought it prudent to leave her estate to steady hands. It is all the more poignant that widow Rebecca was remembered with a bequest that was unlikely to have been made to her husband, Charles, had he been alive. It has increasingly been recognised independent women not uncommonly have bestowed their estate, in part or in full, on other women. This was to enable younger women to maintain an independent life, or to recognise services rendered by servants, family or friends, or just to acknowledge bonds of affection. Financially secure widows who controlled their own means were less likely to remarry while unmarried women with financial wherewithal were more likely to stay that way. Janet’s bequests reflect this pattern, as do the long widowhoods of Maria Oldfield (36 years) and Marion Stone (45 years). The length of Janet’s widowhood is unknown. While Winifred Ferrier’s independence was more likely to result from her share of her parents’ estate, Janet’s earlier bequest would have begun her lifetime of self-sufficiency. Without any personal communications to narrate the stories of the Anderson women, I have used official sources such as census data, birth, marriage and death records, wills, and newspaper accounts (from the wonderful British newspaper archives) to speculate about their lives. All my inferences are clearly just that but what, I think, can be said is that they were women of substance who took responsibility for their destinies insofar as the fates allowed.